This page contains answers to questions submitted by readers. If you have a question about profiling or color management in general, please feel free to send us an email. Why are we offering these profiles? 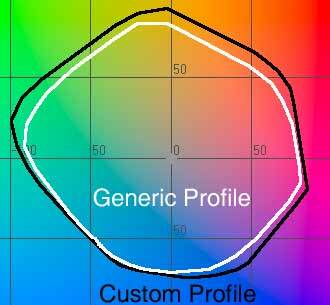 What are the differences between generic and custom profiles? Will a profile make my prints match what I see on my monitor? Can Frontier and Noritsu printers really be profiled? Are all printers the same? What are the differences betwen the various Frontier and Noritsu models? Why are you offering profiles for digital labs? Our goal is to provide the photographic community with the means of using today's color management technology in their own work. Digital printers are increasingly common in labs worldwide, and are capable of excellent output. With a suitable color profile the output is even better, and many of the potential problems with typical lab processing can be circumvented. Therefore, as this database grows, we can all get good quality, relatively inexpensive prints both at home and on location. Also, helping other photographers gain experience with color management benefits us all in the long run. We will not charge for access to our database of Frontier and Noritsu profiles - it is a service to photographers worldwide. Are there real differences between custom profiles and the generic ones that printer manufacturers supply? Yes. Generic profiles are just that — generic. They describe the general properties of a printer/paper combination. Depending on the manufacturer, and how tightly controlled their process is, generic profiles will have varying accuracy. Some manufacturers measure many printers to make their profiles, others appear to only profile a handful at most. Basically, using a generic profile is a gamble. If your printer, ink, and paper closely match the ones used to create the profile, you'll be happy. If not, you need a custom profile. Generic profiles suffer from another problem; they describe the manufacturing process at a single snapshot in time. For example, Epson inkjet inks were among the most consistent available. Many users managed with a single profile for multiple batches of ink and paper. Epson then switched from making inks in Japan to a plant in China. The ink formulation also changed, which required new profiles. Also, Epson rewrote some printer drivers, which drastically changed the color response. Blindly sticking to a single generic profile through these changes results in curious and not entirely pleasing color changes. An example of the difference between a generic and custom Epson 2000P profile for semi-gloss paper is shown in the figure below. The generic profile describes a significantly smaller gamut. This corresponds to less saturated colors being available for printing than the new ink and driver supported. 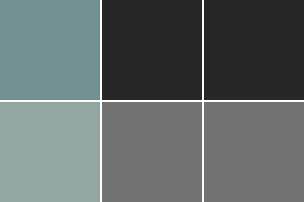 The different shape of the overall gamut also created a blue-green cast to all neutral tones. The second figure shows this: the output with a generic profile for two neutral colors is compared with the target color and the color obtained from a custom profile. Output comparison from Epson 2000P generic and custom profiles on Epson premium semi-gloss paper. The target squares (middle) contain neutral colors that the printer was told to print. The squares on the left were what came out of the printer when Epson's generic profile was used. The squares on the right show the improvement a custom profile made. The neutral colors with the custom profile remain very slightly green, which is a known problem with the 2000P. Still, they are far better than what the printer spat out using the generic profile. A Frontier-specific example is shown below. Profiles from two randomly chosen Frontier printers in our database are compared to sRGB and Adobe RGB (2-dimensional a-b plot from L*ab space, with L=50%). Both printers used Fuji Crystal Archive paper. As can be seen, neither printer is a particularly good match for sRGB. Frontier #1 significantly exceeds the sRGB gamut in the blue-green, cyan, and orange range. Also, the color gamuts of the two printers do not match each other. Again, a generic profile will not be of much use given this level of variation. What does this imply for photographers? Well, you can either convert your files to sRGB, potentially sacrificing the most vibrant colors the printer can produce, and hope for the best. If your camera or scanner provides a wider color space for output than sRGB, use it combined with a custom profile to utilize the full color capabilities of the Frontier. That is the ideal goal, although how well the prints match depends on many factors. The most significant is that your monitor emits light while light is reflected from a print. Some differences are therefore unavoidable. Also, some printers have wider a gamut than most monitors. Frontier and Noritsu printers, for example, can produce more saturated shades of orange than most displays are able to show. The key to the best color matching is Photoshop's soft proofing feature. As described in our sample work flow, soft proofing will help you get the most out of your printer. Definitely. Both Frontier and Noritsu printers have robust self-calibration routines. These compensate for variations in paper, temperature, light source, etc. The printers were designed to work in a very demanding environment — a mini-lab with relatively untrained operators. The assumption made by Fuji and Noritsu was that since the operators were likely unable to adjust the machines, the machines must adjust themselves. These printers also have automatic image enhancement and correction routines. These attempt to correct exposure problems, unbalanced lighting conditions, softness, etc. From the perspective of a skilled photographer, there are two problems with this approach. First, the image correction routines try to adjust images that need no correction. Also, the adjustments are image data specific; i.e. as the content of the image changes, so does the "correction" applied. This is why we stress that all targets must be printed using the "no corrections" mode, where all automatic adjustments and enhancements are turned off. When this is done, we are left with an exceptionally stable printing platform — in other words, a printer that is ideally configured for profiling. Profiles for Frontier and Noritsu printers typically only need to be updated after the printer has major repairs or drastic tweaks to the color channels. In the normal mini-lab setup, these do not occur frequently. If a profile needs updating, send us a new target, and we will measure it again. What are the differences between the Frontier and Noritsu models? The Frontier 330, 340, and 390 can make prints up to 8x12 inches. The Frontier 350 and 370 can make prints up to 10x15 inches. The print quality of all three is very close, but the 330, 370 and 390 machines have a slightly larger gamut than do 350 printers, and are faster at printing. The 330 has Fuji's newest scratch and dust elimination software if you are using the Frontier as a scanner. The 340 is similar with faster processing. Noritsu printers use either a laser or MLVA (Micro Light Valve Array) to print on the photo paper. The MLVA models (2xxx) print at 400 dpi, while the laser models (3xxx) make 320 dpi prints. Sizing your files to these resolutions gives the best results. The 400 dpi Noritsu printers in particular give stunningly sharp images — even better than the Frontier. In general, color saturation is slightly lower on the Noritsu models than on a Frontier. Noritsu models print up to 12x18 inches. Our recommendations for printing: For portrait or wedding work, the combination of Noritsu printers and Kodak Royal paper is excellent. The Kodak pro papers do even better. For highest saturation, use a Frontier printing on Fuji Crystal Archive paper. The Noritsu printers also work well with Crystal Archive, delivering slightly lower saturation than do Frontiers. The sharpest prints, given a tack-sharp and sufficiently large original, come from the Noritsu machines. Avoid labs that use the low grade papers. The print quality is typically abysmal, as none of these printers are happy with cheap paper. For best results, find a lab using the professional grade Fuji or Kodak papers. The difference is significant. The image below compares the midtone color range of two representative printers: a Fuji Frontier 370 and a Noritsu 3101. Individual printers may have more or less range in any particular color. Both models, however, exceed the sRGB gamut over at least part of the range. If your image source is from a device that records color in a wider space than sRGB, you are doing yourself no favor by converting to sRGB. Labs using Pro grade papers or high end printers such as LightJet, Chromira, or Durst Epsilon/Lambda models exceed the Adobe RGB gamut in some areas. See our printer gamut comparison pages for full, 3-D models of these printers, digital cameras, and scanners.